1 A None No Power Seat 1 A is a standard Business Class seat, however, the proximity to the lavatory and galley might be bothersome. There is no floor storage for this seat during takeoff and landing. 1 D None No Power Seat 1 D is a standard Business Class Bulkhead seat. 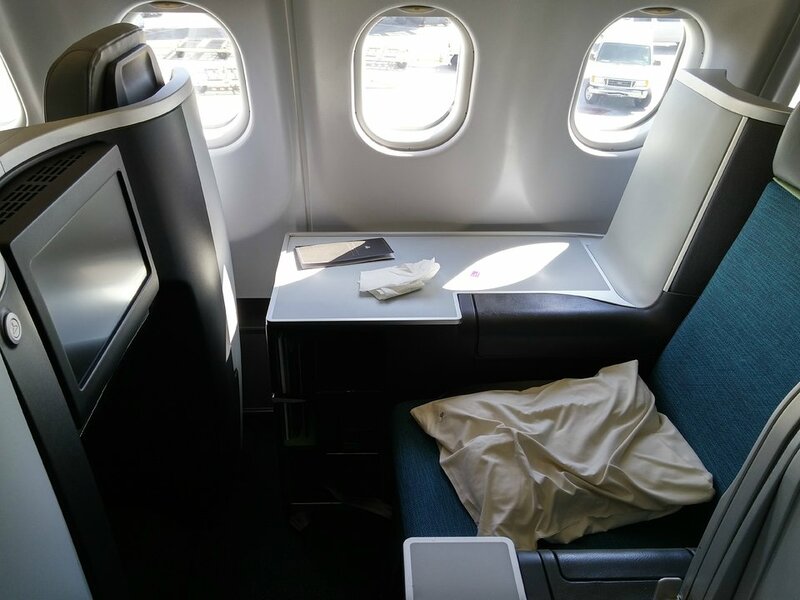 The close proximity to the galley and the position of the seat/bed to the aisle might be bothersome. There is no floor storage for this seat during takeoff and landing. 1 G None No Power Seat 1 G is a standard Business Class seat, however, the proximity to the lavatory and galley might be bothersome. There is no floor storage for this seat during takeoff and landing. 10 A None No Power Seat 10 A is a standard Economy Class seat that Aer Lingus designates as a 'Choice Seat'. Passengers with Choice Seats enjoy priority boarding and early access to the overhead bins. 10 C None No Power Seat 10 C is a standard Economy Class seat that Aer Lingus designates as a 'Choice Seat'. Passengers with Choice Seats enjoy priority boarding and early access to the overhead bins. 10 H None No Power Seat 10 H is a standard Economy Class seat that Aer Lingus designates as a 'Choice Seat'. Passengers with Choice Seats enjoy priority boarding and early access to the overhead bins. 10 K None No Power Seat 10 K is a standard Economy Class seat that Aer Lingus designates as a 'Choice Seat'. Passengers with Choice Seats enjoy priority boarding and early access to the overhead bins. 11 A None No Power Seat 11 A is a standard Economy Class seat that Aer Lingus designates as a 'Choice Seat'. Passengers with Choice Seats enjoy priority boarding and early access to the overhead bins. 11 C None No Power Seat 11 C is a standard Economy Class seat that Aer Lingus designates as a 'Choice Seat'. Passengers with Choice Seats enjoy priority boarding and early access to the overhead bins. 11 D None No Power Seat 11 D is a standard Economy Class seat that Aer Lingus designates as a 'Choice Seat'. Passengers with Choice Seats enjoy priority boarding and early access to the overhead bins. 11 E None No Power Seat 11 E is a standard Economy Class seat that Aer Lingus designates as a 'Choice Seat'. Passengers with Choice Seats enjoy priority boarding and early access to the overhead bins. 11 F None No Power Seat 11 F is a standard Economy Class seat that Aer Lingus designates as a 'Choice Seat'. Passengers with Choice Seats enjoy priority boarding and early access to the overhead bins. 11 G None No Power Seat 11 G is a standard Economy Class seat that Aer Lingus designates as a 'Choice Seat'. Passengers with Choice Seats enjoy priority boarding and early access to the overhead bins. 11 H None No Power Seat 11 H is a standard Economy Class seat that Aer Lingus designates as a 'Choice Seat'. Passengers with Choice Seats enjoy priority boarding and early access to the overhead bins. 11 K None No Power Seat 11 K is a standard Economy Class seat that Aer Lingus designates as a 'Choice Seat'. Passengers with Choice Seats enjoy priority boarding and early access to the overhead bins. 12 A None No Power Seat 12 A is a standard Economy Class seat that Aer Lingus designates as a 'Choice Seat'. Passengers with Choice Seats enjoy priority boarding and early access to the overhead bins. 12 C None No Power Seat 12 C is a standard Economy Class seat that Aer Lingus designates as a 'Choice Seat'. Passengers with Choice Seats enjoy priority boarding and early access to the overhead bins. 12 D None No Power Seat 12 D is a standard Economy Class seat that Aer Lingus designates as a 'Choice Seat'. Passengers with Choice Seats enjoy priority boarding and early access to the overhead bins. 12 E None No Power Seat 12 E is a standard Economy Class seat that Aer Lingus designates as a 'Choice Seat'. Passengers with Choice Seats enjoy priority boarding and early access to the overhead bins. 12 F None No Power Seat 12 F is a standard Economy Class seat that Aer Lingus designates as a 'Choice Seat'. Passengers with Choice Seats enjoy priority boarding and early access to the overhead bins. 12 G None No Power Seat 12 G is a standard Economy Class seat that Aer Lingus designates as a 'Choice Seat'. Passengers with Choice Seats enjoy priority boarding and early access to the overhead bins. 12 H None No Power Seat 12 H is a standard Economy Class seat that Aer Lingus designates as a 'Choice Seat'. Passengers with Choice Seats enjoy priority boarding and early access to the overhead bins. 12 K None No Power Seat 12 K is a standard Economy Class seat that Aer Lingus designates as a 'Choice Seat'. Passengers with Choice Seats enjoy priority boarding and early access to the overhead bins. 13 A None No Power Seat 13 A is a standard Economy Class seat, however, a window is missing in this row. 13 K None No Power Seat 13 K is a standard Economy Class seat, however, a window is missing in this row. 2 A None No Power Seat 2 A is a standard Business Class seat. The position of the seat/bed to the aisle might be bothersome. 2 D None No Power Seat 2 D is a standard Business Class seat. This seat has a nice wide console for storage and protection from aisle activity. 2 G None No Power Seat 2 G is a standard Business Class seat. The seat/bed to the aisle might be bothersome. 2 H None No Power Seat 2 H is a standard Business Class seat. The position of the seat/bed to the aisle might be bothersome. 26 A None No Power Seat 26 A is a standard Economy Class seat, however, the proximity to the lavatory might be bothersome. Also, a window is missing in this row. 26 C None No Power Seat 26 C is a standard Economy Class seat however, the proximity to the lavatory might be bothersome. 26 H None No Power Seat 26 H is a standard Economy Class seat however, the proximity to the lavatory might be bothersome. 26 K None No Power Seat 26 K is a standard Economy Class seat however, the proximity to the lavatory might be bothersome. Also, a window is missing in this row. 27 D None No Power Seat 27 D is a standard Economy Class seat however, the proximity to the lavatory might be bothersome. 27 G None No Power Seat 27 G is a standard Economy Class seat however, the proximity to the lavatory might be bothersome. 28 D None No Power Seat 28 D is a standard Economy Class seat however, the proximity to the lavatory and galley might be bothersome. 28 G None No Power Seat 28 G is a standard Economy Class seat however, the proximity to the lavatory and galley might be bothersome. 29 D None No Power Seat 29 D is a standard Economy Class seat however, the proximity to the lavatory and galley might be bothersome. 29 E None No Power Seat 29 E is a standard Economy Class seat however, the proximity to the lavatory and galley might be bothersome. 29 F None No Power Seat 29 F is a standard Economy Class seat however, the proximity to the lavatory and galley might be bothersome. 29 G None No Power Seat 29 G is a standard Economy Class seat however, the proximity to the lavatory and galley might be bothersome. 30 A None No Power Seat 30 A is an Economy Class seat that has extra legroom due to the exit, however, the proximity to the lavatory and galley might be bothersome. The tray table and IFE monitor are in the armrest making the armrest immovable and slightly reducing seat width. There is no floor storage during take-off or landing. 30 C None No Power Seat 30 C is an Economy Class seat that has extra legroom due to the exit, however, the proximity to the lavatory and galley might be bothersome. The tray table and IFE monitor are in the armrest making the armrest immovable and slightly reducing seat width. There is no floor storage during take-off or landing. 30 D None No Power Seat 30 D is a standard Economy Class seat that might have restricted legroom due to the position of the bulkhead. The proximity to the galley might be bothersome. The tray table and IFE monitor are in the armrests making the armrests immovable and slightly reducing seat width. This is a bassinet location. A passenger traveling with an infant might be seated here. There is no floor storage for this seat during take-off and landing. 30 E None No Power Seat 30 E is a standard Economy Class seat that might have restricted legroom due to the position of the bulkhead. The proximity to the galley might be bothersome. The tray table and IFE monitor are in the armrests making the armrests immovable and slightly reducing seat width. This is a bassinet location. A passenger traveling with an infant might be seated here. There is no floor storage for this seat during take-off and landing. 30 F None No Power Seat 30 F is a standard Economy Class seat that might have restricted legroom due to the position of the bulkhead. The proximity to the galley might be bothersome. The tray table and IFE monitor are in the armrests making the armrests immovable and slightly reducing seat width. This is a bassinet location. A passenger traveling with an infant might be seated here. There is no floor storage for this seat during take-off and landing. 30 G None No Power Seat 30 G is a standard Economy Class seat that might have restricted legroom due to the position of the bulkhead. The proximity to the galley might be bothersome. The tray table and IFE monitor are in the armrests making the armrests immovable and slightly reducing seat width. This is a bassinet location. A passenger traveling with an infant might be seated here. There is no floor storage for this seat during take-off and landing. 30 H None No Power Seat 30 H is an Economy Class seat that has extra legroom due to the exit, however, the proximity to the lavatory and galley might be bothersome. The tray table and IFE monitor are in the armrest making the armrest immovable and slightly reducing seat width. There is no floor storage during take-off or landing. 30 K None No Power Seat 30 K is an Economy Class seat that has extra legroom due to the exit, however, the proximity to the lavatory and galley might be bothersome. The tray table and IFE monitor are in the armrest making the armrest immovable and slightly reducing seat width. There is no floor storage during take-off or landing. 41 D None No Power Seat 41 D is a standard Economy Class seat however, other flyers tend to bump into this seat. 41 G None No Power Seat 41 G is a standard Economy Class seat however, other flyers tend to bump into this seat. 42 D None No Power Seat 42 D is a standard Economy Class seat that might have slightly restricted legroom due to the misalignment of seats with the row ahead. 42 E None No Power Seat 42 E is a standard Economy Class seat that might have slightly restricted legroom due to the misalignment of seats with the row ahead. 42 G None No Power Seat 42 G is a standard Economy Class seat that might have slightly restricted legroom due to the misalignment of seats with the row ahead. 45 A None No Power Seat 45 A is a standard Economy Class seat in the last row of the aircraft whose proximity to the lavatory and galley might be bothersome. 45 C None No Power Seat 45 C is a standard Economy Class seat in the last row of the aircraft whose proximity to the lavatory and galley might be bothersome. 45 D None No Power Seat 45 D is a standard Economy Class seat however, the proximity to the lavatory and galley might be bothersome. 45 G None No Power Seat 45 G is a standard Economy Class seat however, the proximity to the lavatory and galley might be bothersome. 45 H None No Power Seat 45 H is a standard Economy Class seat in the last row of the aircraft whose proximity to the lavatory and galley might be bothersome. 45 K None No Power Seat 45 K is a standard Economy Class seat in the last row of the aircraft whose proximity to the lavatory and galley might be bothersome. 46 D None No Power Seat 46 D is a standard Economy Class seat in the last row of the aircraft whose proximity to the lavatory and galley might be bothersome. 46 E None No Power Seat 46 E is a standard Economy Class seat in the last row of the aircraft whose proximity to the lavatory and galley might be bothersome. 46 G None No Power Seat 46 G is a standard Economy Class seat in the last row of the aircraft whose proximity to the lavatory and galley might be bothersome. 6 A None No Power Seat 6 A is a standard Business Class seat. The position of the seat/bed to the aisle might be bothersome. 6 D None No Power Seat 6 D is a standard Business Class seat. This seat has a nice wide console for storage and protection from aisle activity. 6 G None No Power Seat 6 G is a standard Business Class seat. The seat/bed to the aisle might be bothersome. 6 H None No Power Seat 6 H is a standard Business Class seat. The position of the seat/bed to the aisle might be bothersome. 7 A None No Power Seat 7 A is a standard Business Class seat. This seat has a nice wide console for storage and protection from aisle activity. The proximity to the lavatory and galley might be bothersome. 7 D None No Power Seat 7 D is a standard Business Class seat, however, the proximity to the lavatory and galley might be bothersome. 7 G None No Power Seat 7 G is a standard Business Class seat. This seat has a nice wide console for storage and protection from aisle activity. The proximity to the lavatory and galley might be bothersome. 7 K None No Power Seat 7 K is a standard Business Class seat. The position of the seat/bed to the aisle and the proximity to the lavatory and galley might be bothersome. 8 A None No Power Seat 8 A is an Economy Class seat that has extra legroom due to the exit, however, the proximity to the lavatory and galley might be bothersome. The tray table and the IFE monitor are in the armrest making the armrest immovable and slightly reducing seat width. There is no floor storage during take-off or landing. 8 C None No Power Seat 8 C is an Economy Class seat that has extra legroom due to the exit, however, the proximity to the lavatory and galley might be bothersome. 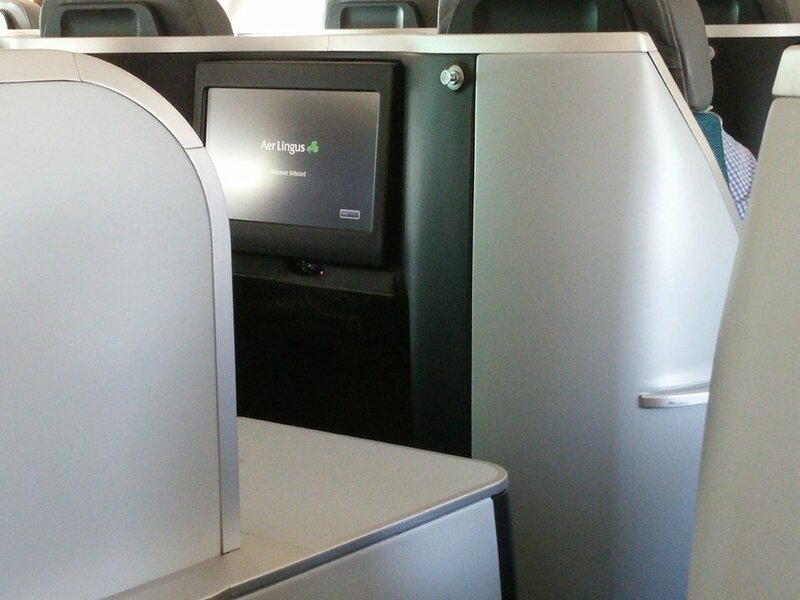 The tray table and the IFE monitor are in the armrest making the armrest immovable and slightly reducing seat width. There is no floor storage during take-off or landing. 8 H None No Power Seat 8 H is an Economy Class seat that has extra legroom due to the exit, however, the proximity to the lavatory and galley might be bothersome. The tray table and the IFE monitor are in the armrest making the armrest immovable and slightly reducing seat width. There is no floor storage during take-off or landing. 8 K None No Power Seat 8 K is an Economy Class seat that has extra legroom due to the exit, however, the proximity to the lavatory and galley might be bothersome. The tray table and the IFE monitor are in the armrest making the armrest immovable and slightly reducing seat width. There is no floor storage during take-off or landing. 9 A None No Power Seat 9 A is a standard Economy Class seat that Aer Lingus designates as a 'Choice Seat'. Passengers with Choice Seats enjoy priority boarding and early access to the overhead bins. 9 C None No Power Seat 9 C is a standard Economy Class seat that Aer Lingus designates as a 'Choice Seat'. Passengers with Choice Seats enjoy priority boarding and early access to the overhead bins. 9 D None No Power Seat 9 D is a standard Economy Class seat that might have restricted legroom due to the position of the bulkhead. The proximity to the galley might be bothersome. The tray table and IFE monitor are in the armrests making the armrests immovable and slightly reducing seat width. This is a bassinet location. A passenger traveling with an infant might be seated here. There is no floor storage for this seat during take-off and landing. 9 E None No Power Seat 9 E is a standard Economy Class seat that might have restricted legroom due to the position of the bulkhead. The proximity to the galley might be bothersome. The tray table and IFE monitor are in the armrests making the armrests immovable and slightly reducing seat width. This is a bassinet location. A passenger traveling with an infant might be seated here. There is no floor storage for this seat during take-off and landing. 9 F None No Power Seat 9 F is a standard Economy Class seat that might have restricted legroom due to the position of the bulkhead. The proximity to the galley might be bothersome. The tray table and IFE monitor are in the armrests making the armrests immovable and slightly reducing seat width. This is a bassinet location. A passenger traveling with an infant might be seated here. There is no floor storage for this seat during take-off and landing. 9 G None No Power Seat 9 G is a standard Economy Class seat that might have restricted legroom due to the position of the bulkhead. The proximity to the galley might be bothersome. The tray table and IFE monitor are in the armrests making the armrests immovable and slightly reducing seat width. This is a bassinet location. A passenger traveling with an infant might be seated here. There is no floor storage for this seat during take-off and landing. 9 H None No Power Seat 9 H is a standard Economy Class seat that Aer Lingus designates as a 'Choice Seat'. Passengers with Choice Seats enjoy priority boarding and early access to the overhead bins. 9 K None No Power Seat 9 K is a standard Economy Class seat that Aer Lingus designates as a 'Choice Seat'. Passengers with Choice Seats enjoy priority boarding and early access to the overhead bins. Each seat has a personal in-seat TV with AVOD (Audio and Video on Demand). Passengers seated in Business Class may create their own personal playlists, using the thousands of MP3s available. Each seat has a personal in-seat TV with AVOD (Audio and Video on Demand) which allows passengers to watch a variety of movies, television programs and music videos. Headphones are provided complimentary on all long-haul flights. Wi-Fi is available on all A330 aircraft on transatlantic routes. The Aer Lingus Airbus A330-300 is primarily operated on medium to long-haul routes. This A330-300 features a two class configuration with 30 flat bed Business Class seats and 287 standard Economy Class seats. All the H seats have under them a metal box, provably related to the enterteiment system, this bos reduces the space for your feet. Moreover some edges appear to be sharp. 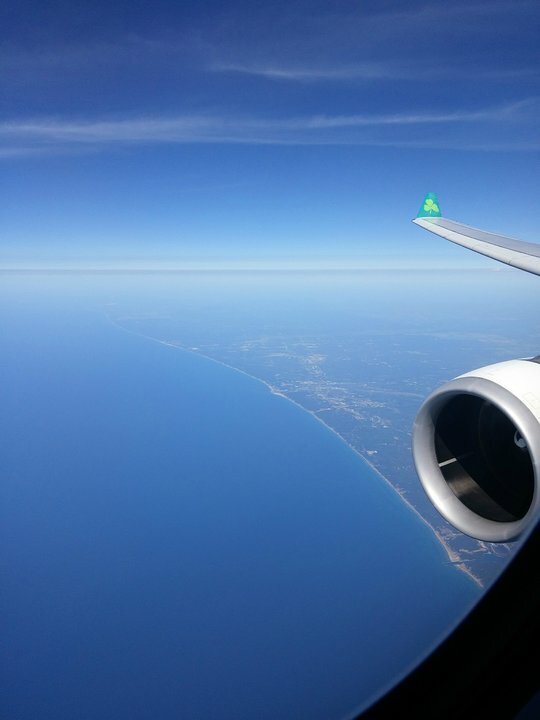 I was on the Aer Lingus flight from Chicago to Dublin on December 28th 2018. I was glad to have paid the extra money for this seat, primarily because it was faster to exit as we had a tight connection, but overall the seat was very comfortable with decent leg room and good padding. I am only 5'4, but my significant other is 6'3 and he was comfortable for this flight. The cost was only $45/pp to sit closer and I would gladly pay it again in the future. 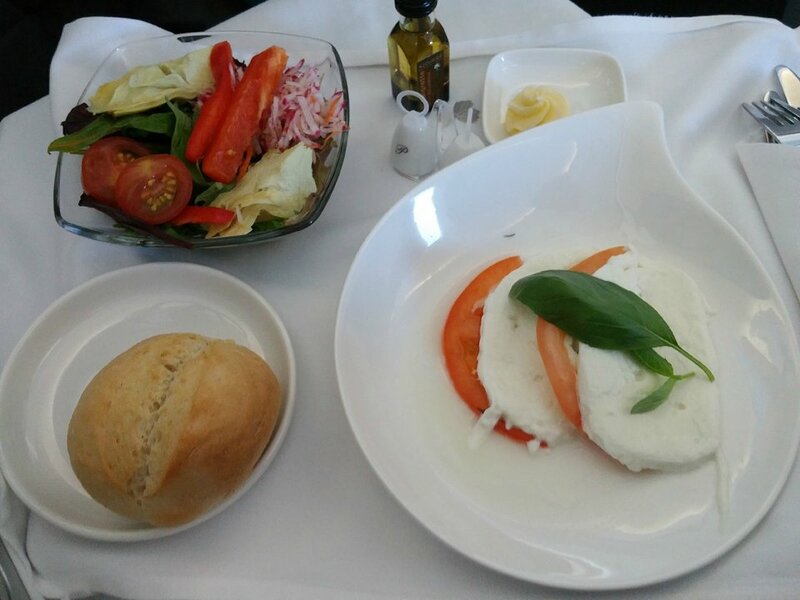 **Other suggestion is if you are on Aer Lingus, buy the BIA meal which was excellent. We were served first, the presentation was beautiful and the food was piping hot. Again, the little extras that make a long haul trip more enjoyable. This is one of the worst seats I have ever been allocated. This seat and 40K are at an angle with 2-3 inches less legroom because it is angled towards the seat in front. Also impossible to fully open a standard laptop. This was one of the most uncomfortable seats I have ever sat on. I paid an additional 80 for the privilege of being wedged in to this narrow seat. Yes there is (notionally) extra legroom but it was soon filled up with people waiting for the WCs and doing their exercises whilst chatting to each other, that combined with the noise from the galley made it a most uncomfortable experience. Nor worth the extra money. This seat gets you prioroty boarding, but there is no overhead storage and you have to sit there whilst the rest of the plane is boarded which can be a chilly experience on a cold day .The area in front of this seat is often filled with people waiting to use the lavatory meaning the extra space you pay for is basically a waiting area also used by people doing stretching excercises or just having a conversation disturbing when you are trying to sleep, on the plus side you do have a window and are the first coach passengers to disembark but am not sure if the extra charged form these seats is worth it. I've flown Aer Lingus eight times and like their planes, fares and Dublin Airport. But the new Airbus 330-330s have thin padding and minimal support in their economy class seat bottoms. My hips and legs ached for most of the 7-9 hour transatlantic flights. My only help, after many hours, was placing two thick inflight magazines together under me on the seat cushion. Tell Aer Lingus to replace these seat bottoms. The seat does not have a console protecting it from the aisle. The seat in front and behind do. Flew this plane from ORD-DUB and back. The padding on the seats was so thin. I am a female on the smaller side and I barely had any shoulder room. Neither myself nor my friend next to me could get much sleep because we couldn't get comfortable. I ended up using the pillow they give you for lumbar support! The food was decent and there was a good selection of movies and TV shows and the power outlets to charge my phone were nice. This was the most horrible long haul flight I have ever been on (10 hours). The seat and pitch was tiny. I'm 5'11 and I didn't have enough room even though the person in front of me didn't recline his seat fully. There was also a box which took up a third of a foot space. And with broad shoulders I was being continually knocked by people passing by. I now believe what I've heard that Aer Lingus is a terrible airline to fly. Booking 2 trips to the West Coast in the next 6 months - I'll be trying other carriers. A truly horrific experience. At 6" I was constantly hit by the person in front trying to recline their seat leaving my knees heavily bruised 2 days later. The air crew - only to quick to tell me of that customers rights - seeming oblivious to the fact I wasn't doing this on purpose I just didn't have anywhere to put my legs. Arm rest between G and F seats only raises to 45 degrees so no chance of getting a few more inches of space there if your travelling as a couple. Lastly a metal box right under the seat in front to make changing position even more difficult. this plane isn't fit for travelling 7+ hrs trans-Atlantic ... NEVER AGAIN. I'm only 5'5" but I felt squeezed in. I've flown with many airlines and this is possibly the worst imo. When the person in front of you has their seat reclined (and you don't), the entertainment screen is about 4-5 inches from your face! The seat is also uncomfortable. This seat was AWESOME. It was the same price of every other economy seat but could've been closer to a business class price. It's an exit row as well as the first row of economy so there was loads of room to stretch, get up, and even walk around..AND there was a box type thing near the exit door which was the perfect height and distance for a footrest! I was stretched out and practically lying down for the entire flight. And there was enough room between the seat and flight attendants' galley/lavatory so as not to be the least bit disturbing. Highly, HIGHLY recommend! Narrow, hard seat. Metal box takes up foot/leg room. The foot room under the seat in front is restricted on the right foot. 3K and 5K are the best seats on the plane for solo travellers or if you just don't want to talk to you companion(s). The seat is spacious and is adjustable from fully upright to a recliner with leg rest to a fully flat bed. There is a storage locker and small table between the seat and aisle and a table with storage spaces between the seat and windows allowing you to have everything you could possibly need beside you for the flight and keep your bag in the overhead bin. As other comments have noted it is possible to unintentionally hit the controls with your leg and the bed is a bit hard but I slept just fine. Very narrow seat. What you gain in leg space, you lose in comfort. Also, expect people to be tripping over your legs when they head to the lavatory. When the door to the aircraft is closed, there's a lot less leg room - your left leg will have limited space because of the bulky door. Not worth it. There is absolutely NO room to move if the seat in front of you is reclined. The person in front of me was basically in my lap, and I couldn't even open the tray. I've never had such an uncomfortable flight. These seats are absolutely TERRIBLE. They where at the very back and they where very close to the toilets. There was not enough recline that I cannot sleep. When the seat is flat you have 21 inches to sleep, box like design, no room to turn. Most uncomfortable seat ever. Seat controls constantly activated by thigh. What alien designed these seats. Never again. Lots of leg room. My wife had 8K and the door was a good 2 feet in front of her so it didn't bother. On the way home we had 8A/8C and the door did interfere with 8A. Luckily she is 5-5. I'm 6-3 so i took the aisle. Notice the light from the crew area can be bothersome over the flight, especially the overnight ORD>DUB journey, when I really just wanted to sleep but the crew was talking loud and doing their work. To add to previous comments, I flew Dublin - Boston on an A330-200 (EI-EWR) and flew the return on an A330-300 (EI-EAV). The flight on the A330-200 model was quite comfortable; even for a tall person like me. However, the return flight was on a newer aircraft that had seats by a different manufacturer and I agree with previous comments that these newer seats were very bad. I had to continually get up and walk about to relieve the soreness from not being able to sit right. I suggest that when you are booking a flight to/from the USA, go for one served by the A330-200 version. Im 6'2" and the economy seat was painfully uncomfortable. This was combined with Aer Lingus unwritten policy of faking "turbelence" on virtually all long haul flights to keep customers confined to their seats. Needless to say, there is no actual turbulence but it makes it easier for the cabin crew to clear the trays or sell duty free. I have now made it a personal policy to try to use other airlines for all transatlantic economy business travel. Agree with previous comments regarding the lack in comfort in economy class for long haul flights. The seat base is far too thin for a 9 hour flight. Legroom even for a person who is not tall is very restricted in the two seat configuration alongside the windows. As a previous reviewer has pointed out, some kind of metal box under the seat means that you cannot stretch your legs out in a straight line. This means it is extremely uncomfortable if you wish to try and sleep. Tip - do not pay for the "upgraded meal" it's simply not worth it for the quality provided. For a 9 hour flight this seat was extremely uncomfortable. There was little padding on the seat, I added 2 of the small sleep pillows and still was numb after an hour. Could not find the electric connection, it must be at floor level under the seat, not sure if it is a European plug or not. There should have been sufficient leg room in this seat, but a box (possibly for the entertainment system) has been installed under the seats in front which severely restricted the available space. When departing the aircraft, I noticed that many seats have these boxes under them. The only exceptions I saw to this were the E and F seats. Our annual holiday to Spain starts with this flight and our treat for ourselves, business class seats, great comfort and indulgent luxury, flying this Monday cant wait ???????? Great biz class seats. Comfortable, roomy, good storage. FAs are great and food was really, really good. Will fly AE again, hopefully in the near future. Definitely the preferred seats for single travels. The other single seats have half the desk space. 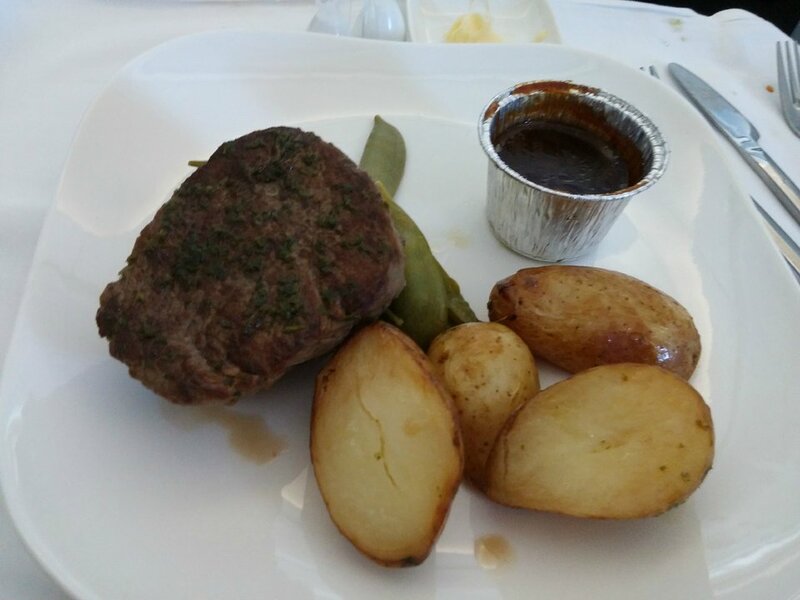 Excellent business class from Aer Lingus. The new business class seats are excellent and the layout is very well designed. Plenty of room to move in your seat, great storage locations and a large screen to watch a selection of movies & TV. The service is excellent with all staff very willing to help with anything you need and always wearing a smile. Found this to be a good seat - toilet is far enough away not to be a problem and the galley wasn't noisy enough to interupt my film viewing. Also has the advantage that you don't end up with someone practically laying in your lap (no exaggeration - Aer Lingus seats recline too quickly and much too deeply). Aer Lingus flies 1 versions of Airbus A330-300.